At Napa Valley Dental Group, we acknowledge and celebrate that moms and dads really do know their kids the best. They know what makes each one “tick” and thrive in this world. 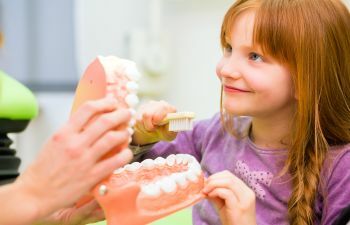 Dentally speaking, we know that our pediatric dentistry treatments at Napa Valley will provide you with a peace of mind, knowing that we will make your child comfortable in the dental chair. It’s important to book your little one’s first dental appointment when their first tooth comes in. During this time we will ensure that you are performing proper dental care and forming healthy dental habits as your child continues to grow. By the age of 6 or 7 your child is in school! This is an exciting time, but it can also cause some stress for you or your child. This is the age when children typically begin losing their baby (primary) teeth. This can cause some anxiousness in your child, if they fear that that snaggle tooth will fall out during the school day. If you sense that a loose tooth is causing your child’s mind to be preoccupied with stress instead of school work, here are some tips to help calm their fears while at school. Reassure your child that the teacher and school nurse are very familiar with children losing teeth at this age. Send your child to school with a baggie or special pouch in their backpack. When and if they lose their teeth at school, they can safely put it in the bag and bring it home so the tooth fairy can bless them with a financial gift in the night. Listen to your child’s needs and concerns. Sometimes just allowing your child to express their fears helps them process the reality of what is actually happening. Call and book your pediatric dentistry appointment with Napa Valley Dental Group today. Together we can help provide for all of your child’s dental needs in a caring and safe environment.